If there is one protein that can be both center of the plate and behind-the-scenes flavoring agent, it is ham. The cured pork takes on many roles, whether sweetly honey baked or salty country smoked, but it offers an umami backbone in sometimes surprising ways. Jesse Roque, owner and executive chef, Never Blue, Hendersonville, N.C.
“Ham salad? I don’t quite get it.” Jesse Roque is here to set you straight if that’s your reaction. “Girl, you haven’t lived until you’ve had deviled ham,” Roque enthuses, referring to her ham salad featuring local country ham from the Midnight Brothers. “It’s so good; it’s such an underrated thing,” she said. At Never Blue, ham salad has been the star of the crowd-pleasing Southern Welcome appetizer course, “our super-Southern take on a crudité” with biscuits, jam, pralines and pimento cheese. Roque said ham salad is best when ham is shredded in a food processor then folded in with cult favorite Duke’s Mayonnaise. For the final component of ham salad, some use sweet relish while some use dill, and the Never Blue version uses both. Host of “The Kitchen,” judge on “Chopped,” cookbook author, chef and restaurateur Geoffrey Zakarian is now also the company spokesperson and resident chef for The Honey Baked Ham Co. At a recent 60th anniversary party for Honey Baked Ham at his restaurant — renamed “The Ham’s Club” for the event — Zakarian created these simply stunning shishito peppers, wrapped in ham. “The heat of the pepper is a perfect foil for the rich, hammy fattiness and smoky ham flavor,” Zakarian said. 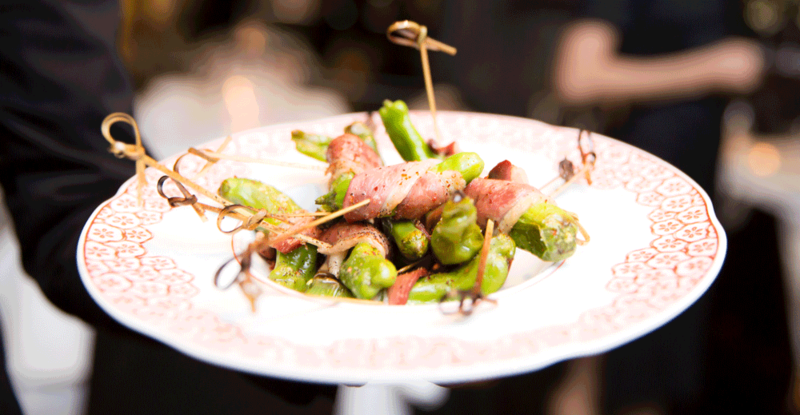 “A perfect blend of fat and heat.” As a game-changing first step, he infused olive oil with ham, then tossed the wrapped peppers in the hammy oil before roasting them to just this side of charred heaven. Bud Taylor, owner and executive chef, The Bistro at Topsail, Surf City, N.C. Adding salty, fatty country ham to the cider/brown sugar/apple cider vinegar mix of a gastrique creates a mind-warping blend of classical French cooking and American coastal country. That’s the situation at The Bistro at Topsail, where Bud Taylor regularly revisits and reinvents his North Carolina roots. He had studied to be a graphic designer, but the magic of collard greens brought him back to the kitchen one Christmas Eve years ago when he cooked the quintessential Southern dish for his family. 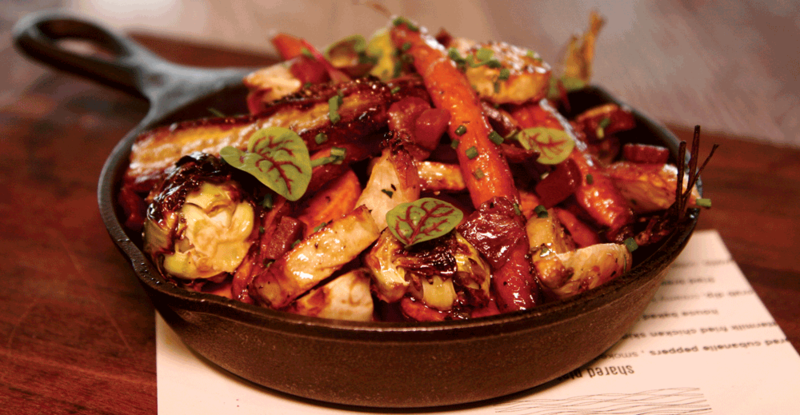 He’s never looked back, showcasing the beauty of the land with roasted veggies like these, cloaked in that surprising, sweet-tart hammy sauce. Hari Cameron, chef and owner, a(MUSE.) inspired food & drink, Rehoboth Beach, Del. 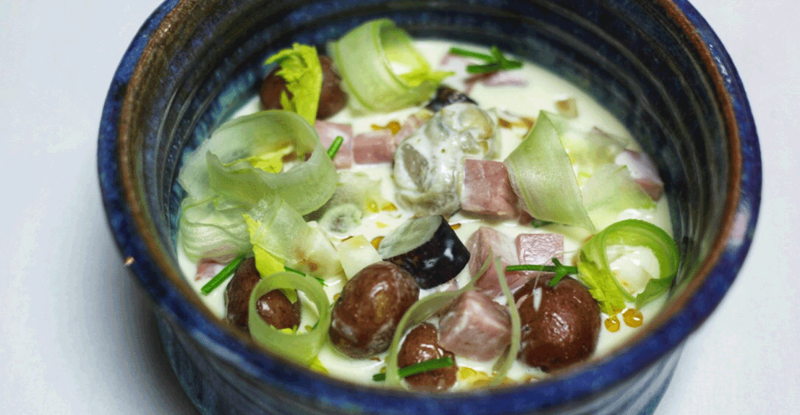 Hari Cameron’s mission statement includes “to entertain in a joyful and cheerful manner,” something that comes through in thoughtful, playful dishes like this oyster and ham stew with strong notes of celery. Cameron starts the base of the stew by simmering ham ends, cleaned oyster shells, kombu seaweed and roasted root veggies. That’s the braising liquid for Delaware Berkshire pork ham. The stew gets potatoes, more root veggies and a shot of cream. The oysters—with their liquor—are poached and then the sophisticated stew is garnished with shaved celery, celery leaf and rendered ham fat.